Harry Leat went into action at the Battle of Flers, 15 September 1916, in the first tank ever to go into action. My Great Uncle Harry was born in 1895 at Westcott, Dorking, Surrey to Alfred and Sarah Leat, the second youngest of ten children. The family moved to Aldershot where he went to East End School. After school he did an apprenticeship at Gale & Polden Printers in Aldershot, Hampshire, where he worked in the letter press department. He enlisted with the British Army as a Private, Gunner and Gearsman and was in the first tank to move into action in the whole world at the villages of Flers and Courcelette on 15 September 2016. A male Mark 1 tank, Daredevil 1, No:765. Daredevil was the first tank ever to go into action, commanded by Harold Mortimore. Find out more here. 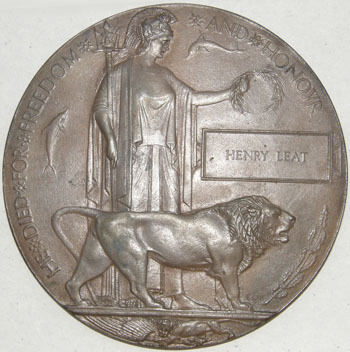 Henry Leat’s Dead Man’s Penny – presented to the family of a soldier killed during the First World War. Harry Leat tragically died 11th April 1917 during the 1st Battle of Bullecourt, France, sadly his body was never found. He is commemorated on the wall at Arras Cemetery. Whilst researching my family genealogy over the years, I became aware that my Great Uncle Harry, on my mother’s side, was more than just a number in the British Army. 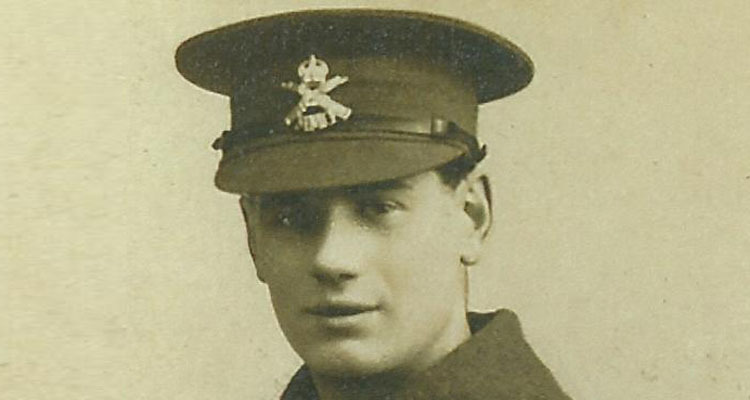 Three photos exist of him, his two World War One medals and his ‘Dead Man’s Penny’ are still in the family. There is also a newspaper article his mother, my Great Grandma, had inserted in the Aldershot News in June 1917, asking of his whereabouts on the Battlefields of the Somme. During my research I discovered so much more on the history of World War One and the impact it had on those involved and their families waiting for them back home. The psychological and emotional impact is incomprehensible to me. I shall continue to research as long as there is access to the Internet and the amazing work of other researchers uploading daily new and valued information for generations to come. I feel closer to Harry even though I had never met him. It brings a lump to my throat and tears to my eyes as a fellow human just trying to imagine the sights, smells and sounds he would have had to endure for months at a time. It is important to never ever forget man’s failings from the past but to learn from them and never allow it to happen again. This has been a total journey of dedication and love to Harry and my family. I would also like to thank all the wonderful people I have met whilst researching My Tank Ancestor.